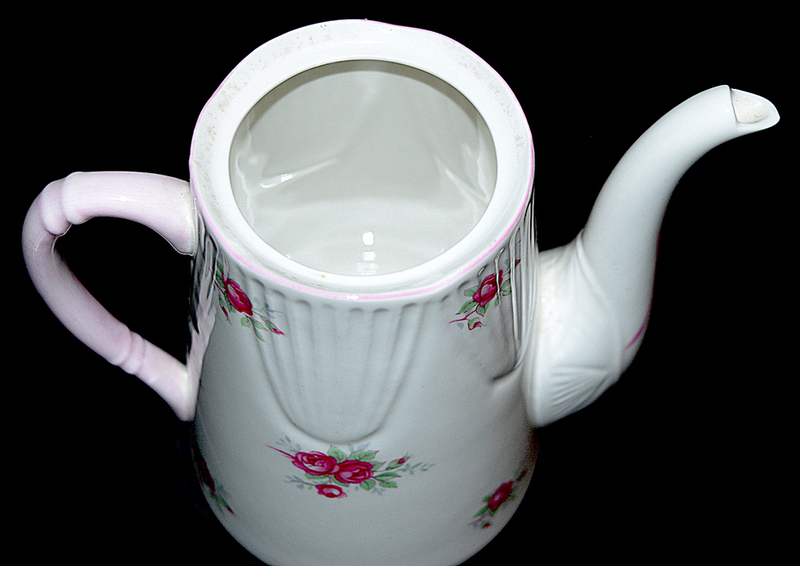 Condition: This pretty rose decorated demitasse coffee pot in the Sweetheart Rose pattern is in Undamaged Condition without chips, cracks, or mold damage. The decoration is beautiful. 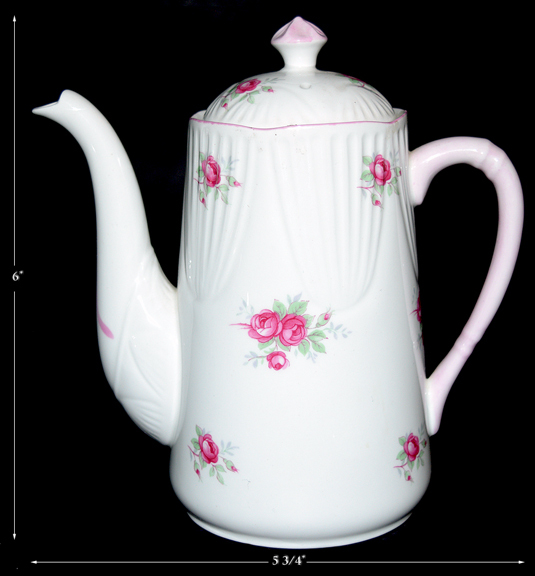 The Sweetheart Rose decoration, and the shape or style of the coffee pot is almost identical to the Shelly Dainty Style demitasse teapot. This was most certainly an attempt to obtain a portion of the market that Shelley dominated at the time. Dinnerware made to go with this coffee pot is also a close match to Shelley's Dainty blanks. The quality of this piece is exceptional. It is much nicer than what you normally see with Royal York coffee pots and teapots; so nice in fact that you may want to purchase this lovely coffee pot to use with a Shelley collection. 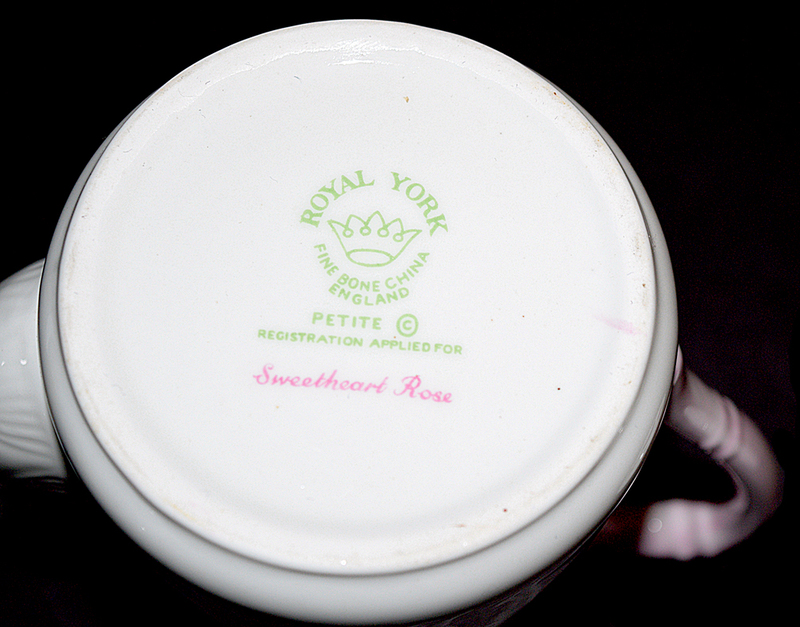 Measurement: 6" H. -5 3/4" W.
Mark: The backstamp on the coffee pot "Royal York Fine Bone China England" In a circle with a crown in the center. Beneath the circle of letters "Petite" ©REGISTRATION APPLIED FOR" and beneath that in cursive writing "Sweetheart Rose". 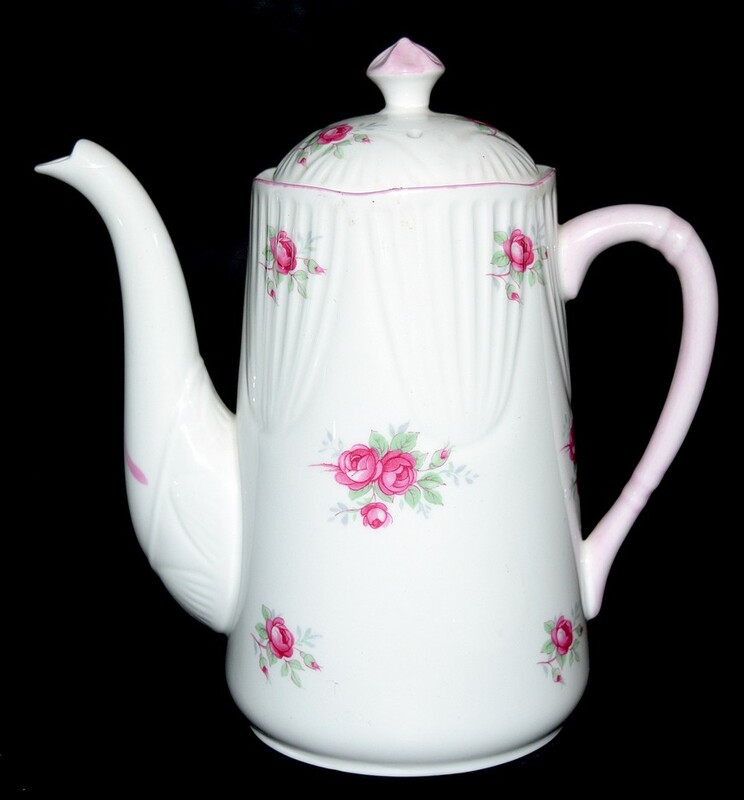 Condition: This pretty rose decorated demitasse coffee pot in the Sweetheart Rose pattern is in Undamaged Condition without chips, cracks, or mold damage. The decoration is beautiful. 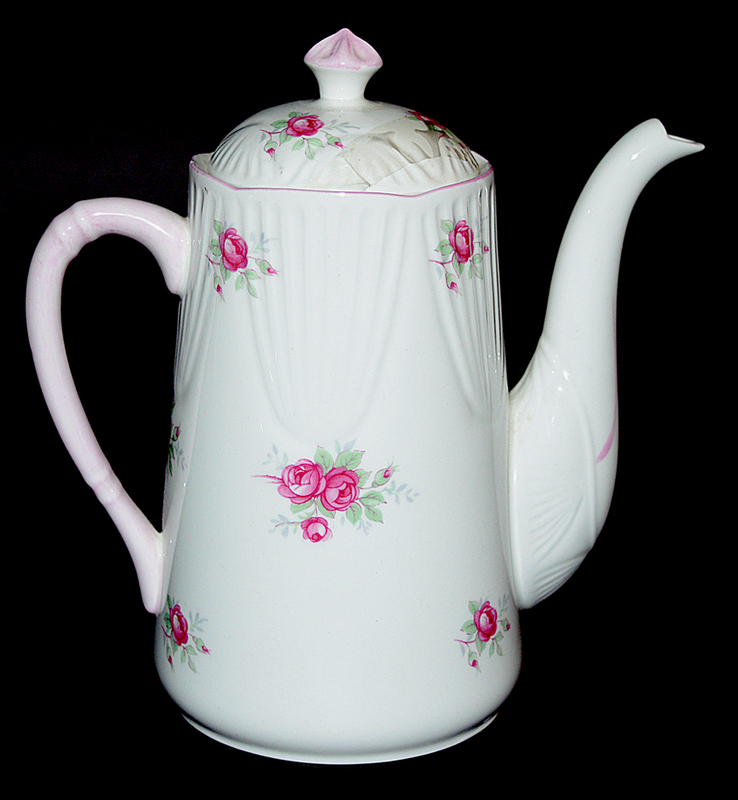 The Sweetheart Rose decoration, and the shape or style of the coffee pot is almost identical to the Shelly Dainty Style demitasse coffee pot. This was most certainly an attempt to obtain a portion of the market that Shelley dominated at the time. Dinnerware made to go with this coffee pot is also a close match to Shelley's Dainty blanks. The quality of this piece is exceptional. It is much nicer then what you normally see with Royal York coffee pots and teapots; so nice in fact that you may want to purchase this lovely coffee pot to use with a Shelley collection. Check out our other merchandise at K and M Antiques and Collectibles. We feature older, vintage antiques and collectibles. Be sure to add me to your favorites list! Come by and visit often! OUR US POSTAGE AMOUNTS ARE SHOWN IN THE SHIPPING TAB WITHIN THE LISTING. WE DO OFFER COMBINED SHIPPING. AS LONG AS YOU PURCHASE YOUR MULTIPLE ITEMS FROM THE SAME LISTING AT THE SAME TIME OUR CALCULATED POSTAGE WILL REFLECT THE DISCOUNT. IF NOT PLEASE ADD ALL ITEMS TO THE CART AND WRITE US BEFORE PAYING FOR YOUR ITEM AND WE WILL SEND YOU A REVISED INVOICE. WE CANNOT SEND A REVISED INVOICE AFTER THE PAYMENT HAS BEEN MADE. Merchandise is guaranteed as stated in the description. All items are carefully examined before listing & again before they are packed. If any errors are made in the representation, a full refund will be issued upon return of the item. Items must be returned via the same manner in which they were shipped. If you wish to ship in another manner, other than the one we have provided please get in contact with us..
© K & M Antiques. All Rights Reserved.